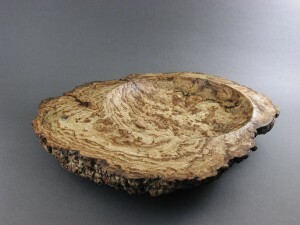 Commissioned pine burl bowl for Judith Rutty-Godfrey. 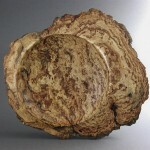 This beautiful burl bowl is an unusual piece. 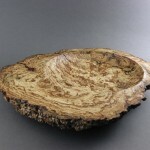 This burl was part of a collection of odd chunks of wood that had been gathered over the years by Judith’s father. When I received it it was dusty, none of the burl figure was visible and the back was (mostly) covered with bark. 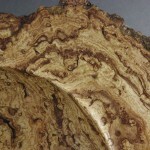 I had never heard of turning pine burls, nor had any of my wood-turning peers–common wisdom is pine burls are not worth the trouble. I was concerned that, being pine, it would be quite pitch-y and hence unworkable. I told Judith that I was not optimistic about creating a worthy piece. When I later cut away the patina of age and saw the actual figure I was astounded. The light color and sandy swirls are amazing. I meticulously picked away the bark from the back side, trued up the face and turned a shallow offset bowl with a slightly raised lip. I think the fact this burl had been stored for years, aged if you will, contributed to the success of this piece. If you have a chunk of a large door yard tree or a burl (pine or not!) 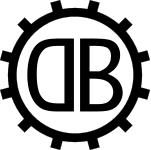 that you would like turned into a family heirloom, feel free to contact me as I would be happy to assist you.